Bendingmomentdiagram.com is a free online calculator that generates Bending Moment Diagrams (BMD) and Shear Force Diagrams (SFD) for most simple beams. The calculator is fully customisable to suit most beams; which is a feature unavailable on most other calculators. 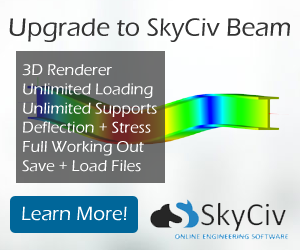 The software is powered by SkyCiv - offering powerful structural analysis and design software on the cloud. The tool is fully functional, so visit our Free Beam Software to get started! It will work for all simply supported, determinant beams and is capable of taking point loads, concentrated moments and distributed loads. It is also extremely adjustable and customizable to allow you to generate your own beams. It is an extremely accurate tool, and unlike current calculators, very user-friendly. It is an extremely useful tool for university, college and high school students who tediously have to redraw BMDs and SFDs for assignments and practice/tutorial questions. We also have a Tutorial page that will help university students with calculations expected in their engineering degree as well as high school students. These students can learn how to calculate and generate Shear Force and Bending Moment Diagrams and we understand the process of beam analysis can sometimes be difficult, so we have provided a simple step by step guide of how to calculate bending moment and shear force diagrams. Included are simple bending moment equations and formulas which well help with your calculations. There are also examples and random beam generators which will allow you to experiment on how different loads affect beam analysis and the shear force and bending moment of a beam. Bending Moment Diagram is powered by the team at SkyCiv Engineering - who offer Student and Professional packages that give users access to a variety of Structural Engineering Software to get the job done. All accounts are subscription based, so you can pay for the software month-to-month as you need it! No more installation, downloading or licence woes! We appreciate your support and feedback, so if you have any questions or concerns please let us know on our Feedback pages. The calculator can accommodate up to 2 point loads, 2 distributed loads and 2 moments on a single beam, which will allow you to enter any number of combinations of loads that you may be asked in a single beam analysis question. The calculations are only set to draw the shear force and bending moment of a beam at the moment. 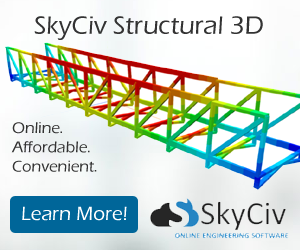 If you need a free frame calculator or free truss calculator, there are a range of other free tools available at SkyCiv.